CAPE CANAVERAL — Loaded with supplies to keep the International Space Station’s crew fed, clothed and busy with new science projects, a Cygnus cargo vessel sped into orbit today atop an Atlas 5 rocket. The 194-foot-tall United Launch Alliance rocket was activated and tested during a seven-hour countdown at its Complex 41 pad, leading to cryogenic fueling with 66,000 gallons of liquid oxygen and liquid hydrogen. With the final status check confirming readiness at T-minus 25 seconds — “Go Atlas,” “Go Centaur,” “Go OA-7” — the computer-controlled countdown proceeded flawlessly and the main engine roared to life at 11:11:26 a.m. EDT (1511:26 GMT). “Go for main engine start, 1, 0 and liftoff of the Atlas 5 rocket with Cygnus and the S.S. John Glenn, extending the research legacy for living and working in space,” NASA launch commentator George Diller called from the Atlas Spaceflight Operations Center, his final liftoff as the voice of launch control before retirement next month. He has worked at the Kennedy Space Center for nearly four decades and served as the commentator for such memorable launches as Hubble, Cassini, Mars Pathfinder, the Spirit, Opportunity and Curiosity rovers and the final space shuttle mission. Aiming Cygnus towards the northeast and the International Space Station’s orbit, the booster employed its advanced steering capabilities to glide into the space laboratory’s orbital plane. Liftoff occurred at the opening of a 30-minute window, a full 15 minutes before the plane crossed over the pad when less agile rockets requiring instantaneous launch opportunities would have targeted. At the time of launch, the station was located 255 miles over the English Channel, southeast of England. The astronauts watched a live feed of the launch that was uplinked from mission control. 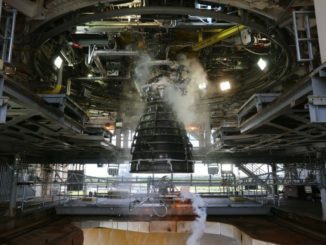 The first stage burned for just over four minutes, delivering on-target performance, before separating from the Centaur upper stage so it could fire for 14 minutes to heave the 15,928-pound Cygnus into the intended 143-mile-high circular orbit, inclined 51.6 degrees to the equator. Cygnus was released from the Atlas 5 some 21 minutes after liftoff, while orbiting above the North Atlantic, to begin its four-day transit the station. It marked the 142nd consecutive successful Atlas program launch spanning more than two decades, the 71st for an Atlas 5 and the 119th in 124 months for United Launch Alliance. This was the 17th commercial mission for the Atlas 5 and third time the rocket has lofted a Cygnus freighter for Orbital ATK under NASA’s station resupply program with private industry. 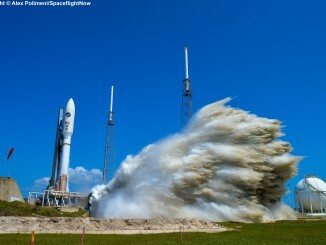 “Atlas 5 performed beautifully,” said Vern Thorpe, United Launch Alliance’s program manager for Commercial Missions. The Centaur, with its job complete, fired its engine for 10 seconds over the Indian Ocean as a de-orbit burn and re-entered south of Australia an hour after liftoff to guard against orbital debris and a future uncontrolled fall from space. The Cygnus, meanwhile, established contact with controllers at Orbital ATK’s hub in Dulles, Virginia, and then unwound its two circular solar arrays — resembling Mickey Mouse ears — to generate electricity. “The status of the spacecraft is great,” said Frank Culbertson, former space shuttle and station astronaut and now Orbital ATK’s Space Systems Group president. Choreographed maneuvers over the 90-hour trek will propel the vessel toward its rendezvous with the International Space Station, meeting up in close proximity early Saturday. The first two burns are planned for later today, followed by another tomorrow, two on Thursday and three on Friday. “It is a multi-phase process. The first couple of days we are phasing with the station and raise our orbit from about 250 km launch insertion orbit to the station’s 400 km orbit,” said Frank DeMauro, Orbital ATK’s vice president and general manager of its Advanced Programs Division in the Space Systems Group. A final “go” to begin joint operations between Cygnus and the station will come Saturday at 1:15 a.m. EDT. 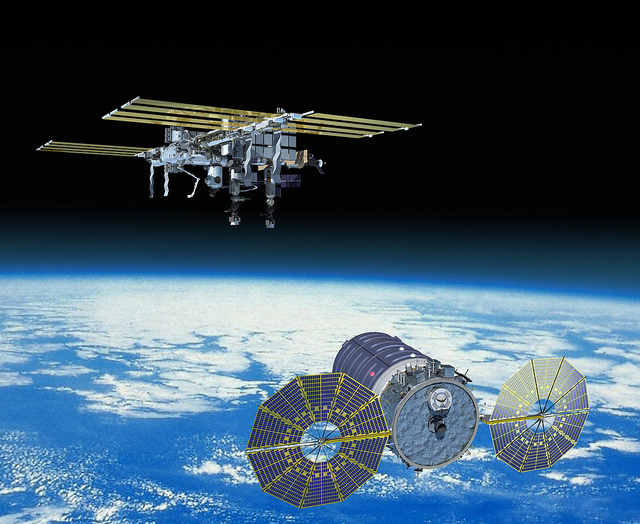 The two craft should be less than four miles (6 km) apart by 2:40 a.m.
Cygnus will approach the station from behind and below, then climb up the radial vector, or R-bar, an imaginary line drawn between the station and the Earth, to reach its grapple point. It will stop at 820 feet (250 meters) around 4:51 a.m. and 98 feet (30 meters) around 5:38 a.m. for ground-based reviews before receiving authority to resume closing. The astronauts, floating in the multi-windowed cupola, will be watching the Cygnus rendezvous to ensure nothing is amiss with the craft. “They are monitoring the whole way. If the crew sees something they don’t like, they have the ability to hit the abort button and we fly away,” DeMauro said. Once the freighter arrives about 40 feet from the station, it will halt its maneuvering and wait for the Canadarm2 to reach out and latch ahold of a grapple fixture on its hull. That is scheduled for 6:05 a.m. EDT (1005 GMT). Cygnus will be berthed to the underside of the Unity module about two hours later for the start of unloading operations. 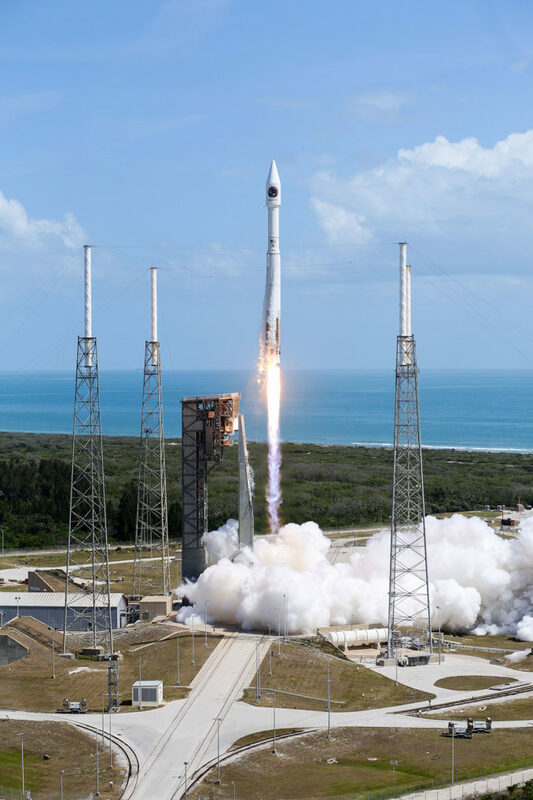 While the upmass number for this Cygnus is slightly less than previously enabled by the Atlas 5 launcher, officials say the vessel is completely packed to the limit. “The cargo module is full. We’ve volumed-out, as we call it. It is a fully packed module, just some of it was a little less dense than last time,” DeMauro said. The freighter is scheduled to remain attached to the station for about 85 days, a period that will allow a more-leisurely unloading schedule for the crew. “By staying that long, we offer the crew the flexibility to unload and then pack around the scientific work. We can stay for a long time,” DeMauro said. With the hatchway open for three months, the astronauts will use the Cygnus as a receptacle for trash and equipment no longer needed on the station. About 3,400 pounds of stuff will be stowed in the ship before it departs to re-enter the atmosphere. “It’s like six people living in a five bedroom house and no one is taking out the trash. It has to go out sometime and so Cygnus, with its big volume, provides a lot of capability for getting that trash off the ISS,” DeMauro said. After departure, Cygnus will climb about 50 miles higher for its free-flight secondary mission. There, the third SAFFIRE space fire experiment will be conducted and four remote-sensing cubesats get deployed. 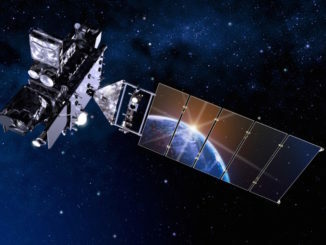 Once all of the SAFFIRE data and video has been downlinked — roughly eight days are earmarked for that — the craft will execute a de-orbit burn to brake from space to re-enter over the South Pacific. Three soccer ball-sized probes as part of a flight-test demonstration for new heat shield materials will be released from inside the Cygnus once it breaks apart. Data from the probes will be relayed through the Iridium satellite communications network. Four more Cygnus missions are scheduled through the end of next year under NASA’s original round of commercial resupply flights. At least six more are planned between 2019 and 2024, some potentially on Atlas 5 if NASA orders up any specific mission to carry extra cargo. 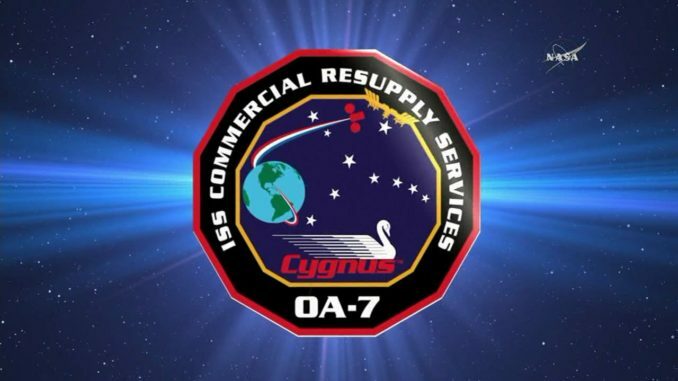 See earlier OA-7 Cygnus coverage. Comments disabled due to foul language.